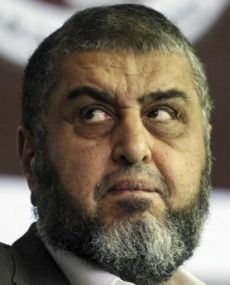 Khairat al-Shater, presidential candidate of Egypt's Muslim Brotherhood and Freedom and Justice Party: Given the influence and size of the Muslim Brotherhood, al-Shater must be considered the frontrunner in the race to become Egypt's first freely-electd head of state. Election day is May 23-24. As I follow the Egyptian presidential election, I pray to Allah that he chooses someone who will lift her up and strengthen her so Egypt can take its place among nations as it should, Allah willing. I have also been following the American presidential election. As anyone can notice, the Republican Party (if you like, the religious party) has shown that it opposes the Democrats (liberals, if you like) on issues like gay marriage and abortion. But the real question is who can pull the country out of economic crisis and guarantee that it will continue to remain the global leader. Regardless of party, the average American voter will choose the candidate most able to fix the country and won’t give a damn who is favored by the media, which loves to make mountains from molehills. There are some media outlets that support the Republican Party, and most of these are religiously extremist. It was they who spread the news, before the Iraq invasion, that George W. Bush was a born again Christian and would crush the rise of Islam. There are also channels that support Democrats and broadcast their ideas. It is fair to say that to some extent, there is fairness in presenting the ideas of both parties and enabling a heated debate without insults, where everyone can express their points of view before allowing the voter to decide. The Republican Party began with ten candidates, and now at the end of the nomination process, two are left. Within a few days, this too should be resolved, and one of them will begin his campaign against Obama. 1) Our diminishing media, which has reached untold levels of stupidity in terms of the frivolity of ideas conveyed and a debate that is biased against one group and supportive of another. We have a dysfunctional media that is not up to the task of helping people make independent decisions during this critical period. 2) Serious mistakes in the actions and statements of those in the Islamic Movement, which have raised suspicion and skepticism within the hearts of Egyptian voters. 3) Serious attempts on the part of the media and minority parties to alienate the people from the Islamic Movement, along with strenuous attempts to lessen the gap between the Islamic Movement and other parties. 4) The minority parties are using every means at their disposal to catch up with the Islamic Movement, the most dangerous of which is to create suspicion about democracy and to try and portray the majority as abusive and monopolistic. Al-Ahram, Egypt: What does the CIA have to do with Democracy and NGO's? Hankyoreh, South Korea: Egypt: Will U.S. Pick the Right Side this Time? 5) Most presidential candidates and their supporters use empty words and have no plan to revive the country or make progress. Only one has put forward a clear plan that includes the ways and means for a revival of the country. I hope after things settle down and the number of candidates drops, we will hear about strong programs for Egypt’s advancement and recovery in these difficult times. 6) The security situation and multiplicity of demands from competing factions is alarming. At any moment, this could be taken advantage of those who wish to besmirch democracy. From this, we ask Allah to protect Egypt. 7) Add to this, the fact that the modern style of debate has been lost, even among those who are expected to adhere to an intellectual, educated dialogue. But despite these seven points, I hope and call upon Allah for help - and I know that he will protect Egypt and its people from harm. The solution to all of the issues previously mentioned is not new laws, but the will of the people. That puts my mind at ease, because the Egyptian people, who rose up to liberate themselves without any foreign help or intervention, can with Allah’s assistance make decisions that will bring Egypt to the place we all want it to go.